It’s common knowledge that carrying extra weight, especially around the midsection, can be detrimental to your health. While it’s important for all men to maintain a healthy weight, obesity can be particularly harmful to your overall health. 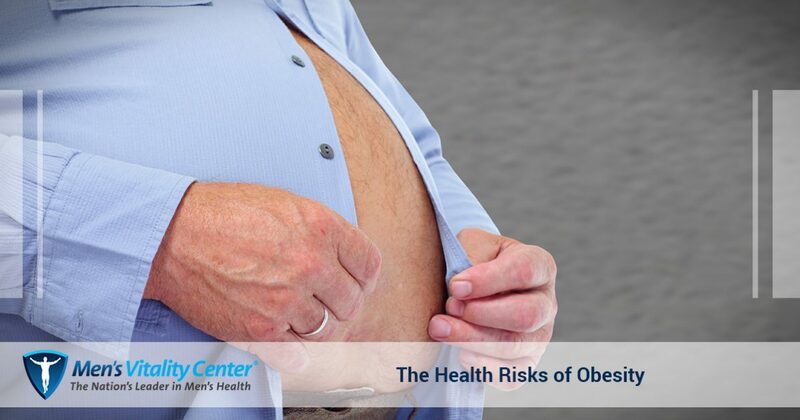 In this post , we’ll outline a few of the risks that obesity can pose to your well-being. If you’re concerned about your weight, the men’s health providers at Men’s Vitality Center are here to help. We offer physical exams, weight loss management, cholesterol management, and more! Contact our office today to schedule an appointment. Obesity is a category for those who weigh at least 20 percent more than the average weight of people with a similar height; obesity is normally measured according to your body mass index (BMI), and is designated by a BMI of 30 or higher. As an example, a 5’6” man weighing 170 pounds is considered overweight, but he wouldn’t be considered obese until he weighed at least 186 pounds (and consequently had a BMI of 30). If you’re an athlete or have a significant amount of muscle mass, your body mass index may not be an accurate indication of your overall health. If this is the case, your doctor can perform other tests to determine your overall health. We’ll now take a look at the health risks of obesity now that we’ve distinguished between being obese and being overweight. Obesity greatly increases your risk of low testosterone levels. 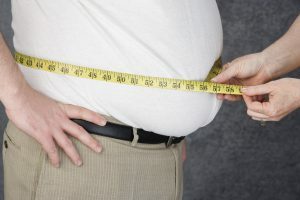 In fact, roughly three-quarters of obese men with a BMI greater than 40 can be expected to have low testosterone levels. Low testosterone levels caused by obesity can lead to muscle mass loss and chronic fatigue, which can make it even more difficult to lose weight. Also referred to as “hypertension,” high blood pressure occurs when your blood is consistently flowing too forcefully through your body. Combined with obesity, chronically elevated blood pressure can increase the likelihood of strokes, heart attacks, vision problems, and other harmful health conditions. Sleep apnea is a condition in which the airways become blocked during sleep, making it difficult to get a restful night’s sleep. Carrying extra weight around the neck can make it more likely that you will experience the symptoms of sleep apnea, and you will probably find yourself feeling fatigued and tired each morning. Snoring and gasping for air during sleep is a common sleep apnea symptom, but it can be nearly impossible to diagnose on your own. If you live with other people, ask them if they ever notice you snoring or having difficulty breathing throughout the night. Losing weight is one of the most effective sleep apnea treatments, though other measures may be taken in more severe cases. If you’re interested in weight management, the men’s health professionals at Men’s Vitality Clinic in Glendale can help! We’ve helped hundreds of men manage their weight, and we’d love to help you restore your health. Contact our Glendale office today to learn more!